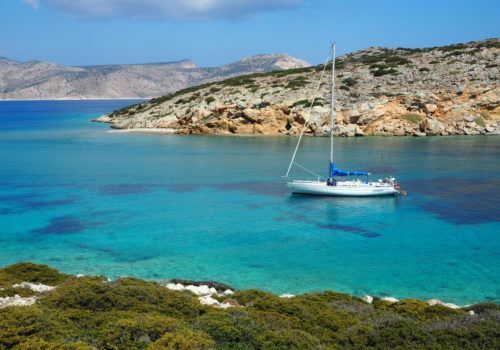 Hire a private yacht to sail the Cyclades on this fully customisable itinerary. Setting sail from Athens you’ll visit small islands such as Kithnos and Serifos, Kea and Aegina. You’ll be on board a beautiful yacht which has the comfort of three double cabins. With your own skipper you’ll be able to enjoy life on board and on shore sampling some of the best Greek tavernas the Mediterranean has to offer. The Cyclades is made up of about 220 islands – the major ones include Paros, Mykonos, Santorini, Ios & Milos whilst the smaller ones include Kythnos, Folegandros, Sérifos, Sífnos & Koufunissi, and many other uninhabited islets. Alimos Marina in Athens is your starting point. Board your boat in the afternoon and enjoy the kitchen and bar for you first Greek sunset. Overnight on board. Sounio is the first contact with ancient Greece. Every visitor admires the beauty of Greek civilisation when they see Poseidon’s temple and get astonished by the magnificent sunrise. Today it’s Kythnos. Bays provide good shelter in pleasant surroundings whilst its white sandy beaches boast crystal clear waters. Kythnos is a barren rocky island little touched by tourism. Numerous anchorages provide beautiful water and the hot mineral springs in Lutra have been well documented throughout history. Near Cape Kafalos you’ll find the ruins of a medieval citadel and town. Serifos is best known for Livadi Village, a beautiful harbour village where you can find the provisions you need for your trip. It is also highly recommended for its nightlife. Serifos has a modern tourist trade in summer with its white houses of the Chora on the hill above Livadi Bay the highlight. The view from the chora down onto the bay and over the sea and islands beyond is well worth the trip. Sifnos is known for its medieval village of Kastro which has been continually inhabited for over 3000 years. It’s a hilly island with its west coast barren and burnt but on the east side on the island, where most of the population live, it is greener and cultivated in places. Today its beaches on its southeast coast are very popular. Kea is mostly barren with patches of cultivated woodland near the coast. The lyric poets Simonedes and Bacchlides come from this island. The picturesque hamlet of Vourkari is most popular and has excellent restaurants. The beautiful chora on the hill has a huddle of glaring white houses and is well worth a visit. A large lion carved from the rock face is attributed to an Ionian sculptor from around 600 B.C. Aegina. The small town around the harbour is a pleasant homely sort of place. The single column on Ak Kolona is all that remains of the temple of Aphrodite that formerly stood on the cape. You’ll find beautiful tavernas around the waterfront and you’ll find good boutiques. Today you’ll return to Athens to complete your wonderful journey. Each boat comes with a skipper who will navigate the yacht between islands. Each day you will need to allow around £75/$100 per person which allows for food, gasoline, harbour fees and mooring fees. The boat rental includes insurance, cleaning and fresh linen and towels.